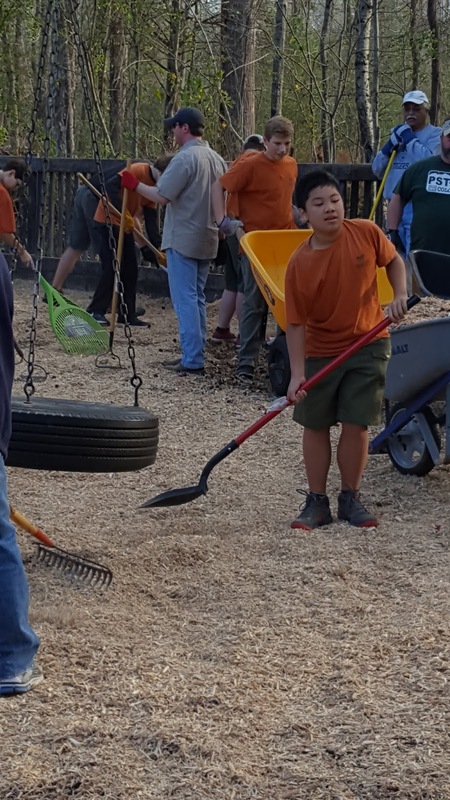 On Saturday, March 25, Troop 50 Scouts, leaders and family members joined with its chartering organization, the Rotary Club of Auburn, as part of the Rotary Club's annual workday at Auburn's Hickory Dickory Park. 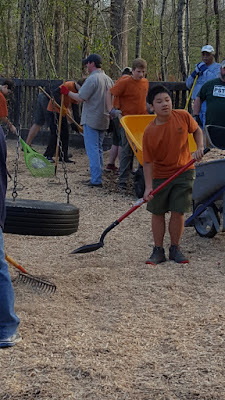 Each year, Auburn Rotarians converge on the part as part of its "March Mulch Madness" to refresh the mulch beds that pad the park's various play areas and to put into practice Rotary International's motto of "service above self." The 11 Troop 50 volunteers were part of a group of 45 total volunteers that also included Rotarians and their family members. Normally, the Auburn Rotary Club budgets four hours to complete the mulching of the play areas and the spraying of wooden surfaces to eliminate mildew. However, thanks to the unusually large group of volunteers, the work was completed in half the time. The troop accumulated more than 20 service hours through the contributions of its volunteers. For some Scouts, those service hours will go toward requirements to earn their next rank or to complete a variety of merit badges. For more photos from the Rotary Club service day, visit the troop's online photo album.